Can You Wear Trail Running Shoes on Pavement? Can You Wear Trail Running Shoes on Roads? Trail running shoes offer more traction and stability, which is exactly what you need when running on rugged terrain and nature trails. Though they are designed for off-road runs, trail shoes are generally safe to wear when running on a road or pavement as well. There may be times when your road shoes may be a better choice, but your trail shoes are likely versatile enough for various road conditions. Many runners have a favorite pair or two of running shoes. Choosing between road and trail shoes is going to depend on a number of factors, particularly where you enjoy running the most. Today's trail runners have much more to offer than the original designs. The first trail shoes were bulky and stiff but today you can find lightweight trail shoes and most offer a great deal of flexibility. This makes them well-suited to road running. However, if you're doing faster workouts such as tempo runs or interval workouts, you may feel more comfortable and faster in a lighter road shoe. Trail shoes are usually made of thicker materials in the uppers. The tightly woven mesh helps prevent rips from trail debris. Most trail shoes also include toe bumpers to protect your toes. Stubbing a toe is never fun and even a well-groomed natural trail may have rocks or obstacles that you can hit. The soles of trail shoes are designed to grip an uneven trail surface. Large lugs, teeth, and a stickier rubber offer better traction to get you over and through dirt, mud, and rocks. Most also have a plate of hard plastic in the mid-sole area to protect your foot from rocks and sharp sticks. Many trail shoes include stability features to help prevent tweaking an ankle on uneven surfaces. These support materials are often along the sides and under your foot. Trail shoes are usually designed with a gusseted tongue to help keep trail debris and gravel out of the shoe. Trail shoes are often heavier than road shoes, although there are lighter-weight versions available. It is very rare to find white trail shoes. They're often produced in darker colors to hide the dirt you'll be running through. You can also find hybrid shoes. These are designed to give you the best features of both trail and road shoes. It's definitely a style to consider if you enjoy running on a variety of surfaces. The weather is also a big factor when determining what type of running shoes to wear. If it's very hot and humid, you may prefer lighter road running shoes over trail runners, so your feet don't get too sweaty. On the other hand, you may find that you're actually better off wearing trail shoes when running on roads or sidewalks during bad weather. The better traction can be a big help on slippery surfaces. They are usually are more water-resistant as well, so they can be more comfortable and safer when running on snow or in the rain. You can even find waterproof versions, which are often labeled with GTX (for Gore-tex). Whether you're running in regular running shoes or trail shoes, the most important factor is whether they're the right shoes for your foot and running gait. Some runners need more support and motion control than others based on the way they run. 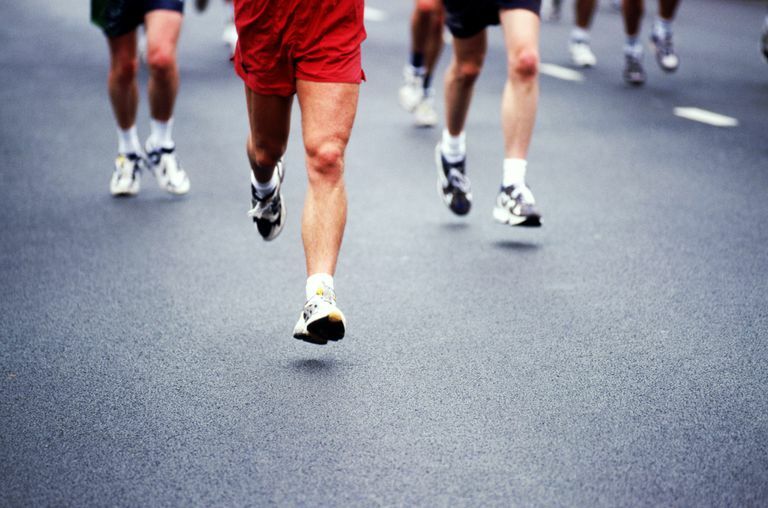 Running in the wrong shoes can lead to discomfort and injuries. If you haven't already, go to a running specialty store and get a gait analysis. This will help a running shoe expert recommend the right shoes for you. One pair of running shoes is often sufficient for a beginner runner. Choose a pair that is best suited to the type of terrain you are likely to run on the most. If you're not quite sure yet, it may be best to get a versatile pair of hybrid shoes so you can try a variety of surfaces. If you're really getting into running, you may want to invest in multiple pairs of shoes. For example, you may want a pair of trail running shoes solely for trail and bad weather running, and a pair of regular running shoes for treadmill and road running. Some runners who run several times a week like to rotate two pairs of running shoes. Alternating shoes will increase the life of each pair because you give them a day or two to decompress and dry out between workouts. Trail running shoes are quite versatile and a great choice if you're interested in running through nature from time to time. The most important factor, however, is finding the best shoes for the type of terrain you enjoy running on. No matter where it is, if you're excited about your run, you are more likely to stay motivated and keep running.